This past weekend, Technical Director Mark Lavin came out to support DiamondHacks, NCSU’s first ever hackathon and conference event for women interested in computer science. Not only is NCSU Mark’s alma mater, but he’s also a strong supporter of co-organizer Girl Develop It RDU (GDI), of which Caktus is an official sponsor. The weekend’s events began Saturday with nervous excitement as Facebook developer Erin Summers took the stage for her keynote address. Most memorable for Mark was a moment towards the end of Summers’ talk, in which she called for collaboration between neighboring audience members. It was at this point Mark first realized he was the only male in the room—a unique experience for a male developer. “I’m sure there’s lots of women who have felt the way I did,” Mark commented. The moment not only flipped the norms of a traditionally male-dominated field, but also filled Mark with a renewed appreciation for the importance of active inclusivity in the tech industry. Aside from helping fill swag bags for the weekend’s participants and attending several of the talks, Mark gave a lightning talk, “Python and Django: Web Development Batteries Included” on Python and Django. Knowing attendees would be thinking about their upcoming projects and which language to build in, Mark chose to advocate for Django (he’s a little biased as the co-author of Lightweight Django). He highlighted the overall uses of Python as well as the extensiveness of its standard library. According to Mark, “Python comes with a lot of built-in functionality,” so it’s a great coding language for beginning developers. 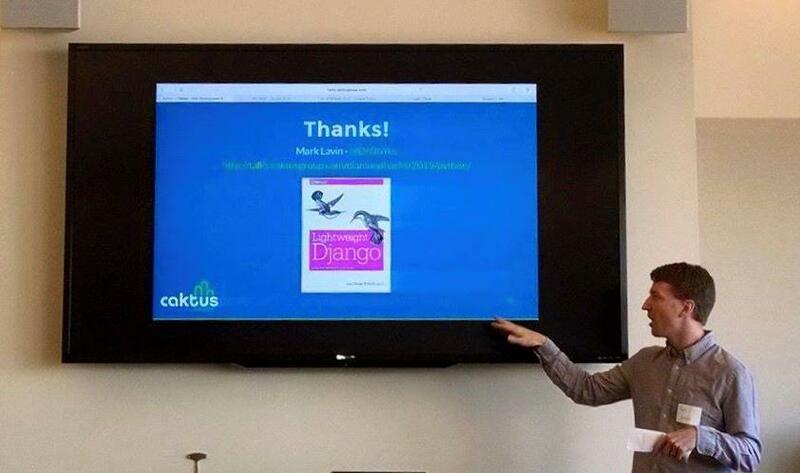 Mark also covered the basic Django view and model in his talk, emphasizing the features that make Django a complete framework—an excellent language for a hackathon. Since supporting diversity in the tech industry was a key focus of the day, Mark also wanted to emphasize the inclusiveness of the Python and Django communities. From the diversity statement on Python’s website, to Django’s code of conduct, the Python community and Django subcommunity have been at the forefront of advocating for diversity and inclusion in the tech world. For Mark, this element has and continues to be “important for the growth of [the] language,” and has contributed to the vitality of these communities. All in all the weekend was a great success, with especially memorable talks given by speakers working for Google, Trinket, and Hirease. Mark was impressed with the students’ enthusiasm and focus and lingered after both of iterations his talk to speak with attendees about their careers and interests. The next day he was equally affected by the range and talent behind Sunday’s hackathon projects as he followed the progress of various teams on Twitter. “These are the students [who] are going to help define what’s next,” he remarked. Can’t get enough of Python, Django, and the talented Mark Lavin? Neither can we. Mark will be leading a workshop at PyCon on Building SMS Applications with Django along with fellow Cakti David Ray and our code school’s lead instructor, Caleb Smith. We’ll hope to see you there!